359/365 – “Meet Shadow” nr.25, a photo by Luca Rossini on Flickr. Twenty fifth day of “Meet Shadow”. 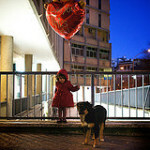 Happy Valentine to you all! My parents collected Agata from school today and delivered her home with this huge, red, heart-shaped balloon. Which obviously Agata now wants to constantly bring along. 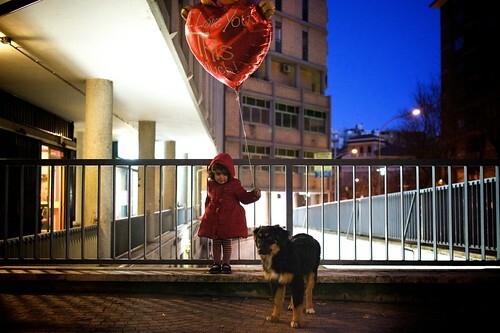 Not easy to walk the chaotic streets of Rome with a two years old girl, a huge-red-heart balloon, and an energetic Aussie puppy. Not easy at all. But an excellent subject to portrait. Nothing good is easy, isn’t it.